We played the superb 'Time' from his first album on 21st Century Roots vol.4. We'll play the uplifting 'True Music' from his second album in a next episode - pure roots reggae & refreshing vibes make it an instant radio classic! This is Germany-based Sebastian Sturm's second full-length release, following his debut 'This Change Is Nice' (2007). These 12 songs appear even more grown-up, and more authentic, even though Sturm is one of the youngest reggae artists in Europe. You won't find any reggae clichés on 'One Moment In Peace', and the music was strictly recorded with real instruments and the tried-and-tested studio equipment as used at Motown and Abbey Road Studios. Carefully combined with modern recording techniques, this recording sounds full of energy but also warm and soulful. 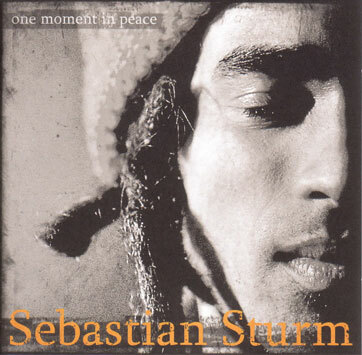 'One Moment In Peace' also reflects the development of Sebastian Sturm's career during the last two years. The readers of Europe's most important reggae magazine Riddim voted him "Best Newcomer" in 2007 and 2008. He has showcased his sensational live performances at countless European festivals, leaving an impression on the audience with his distinctively scratchy voice matched against mellow music. Featuring guest vocals by Jahcoustix.